Let’s be honest: games based on anime are normally quite bad. 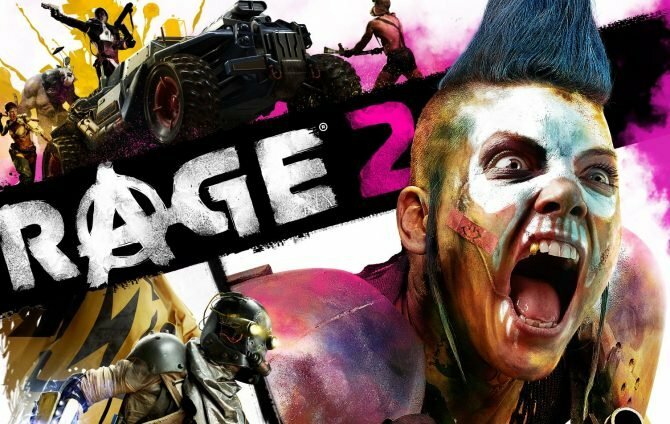 As with games based on movies, developers tend to bank on the popularity of the IP, knowing that fans of that particular title will purchase the game no matter how bad it is, without really focusing on the production values and on making it actually fun. Luckily, Attack on Titan is actually one of the few that detach themselves from this trend. The story is pretty much exactly the same as the anime, and it actually follows it very faithfully, so if you’re familiar with the series, you won’t get many surprises here. Humanity is on the verge of collapse, confined behind three titanic walls designed to keep a ferocious and apparently invincible man-eating race of titans outside. 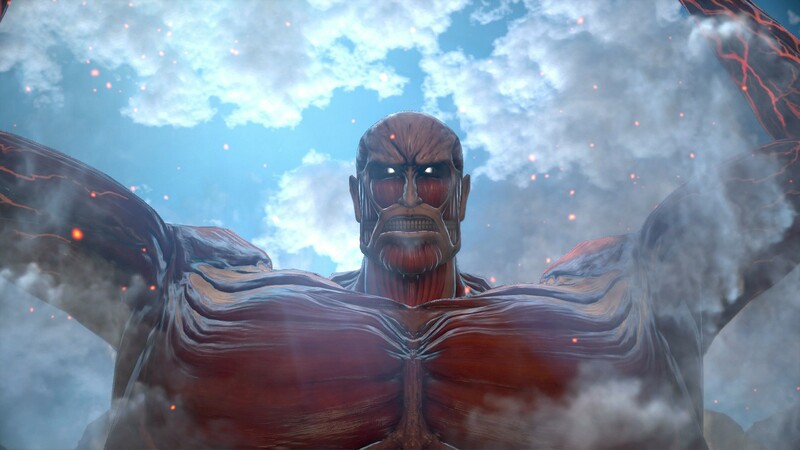 Five years before the events of the game, a colossal titan (since the normal titans aren’t colossal enough) tore a hole in the outermost wall, causing humanity to withdraw to its second line of defense, losing one third of its already limited territory, and a large percentage of its population. Thousands were gruesomely devoured by the feasting titans. 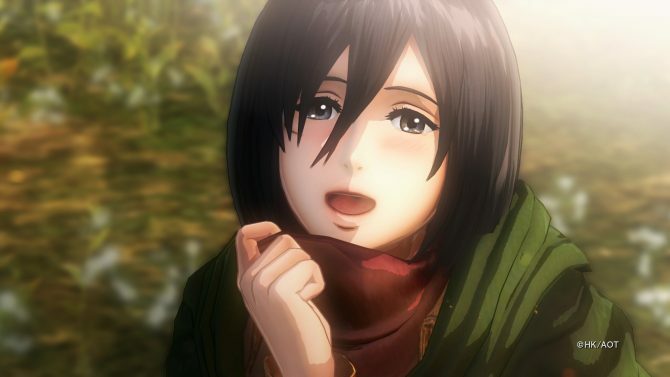 Among those was the mother of protagonist Eren, who sworn revenge and enrolled in the military with the apparently suicidal purpose of finally pushing the titans back. 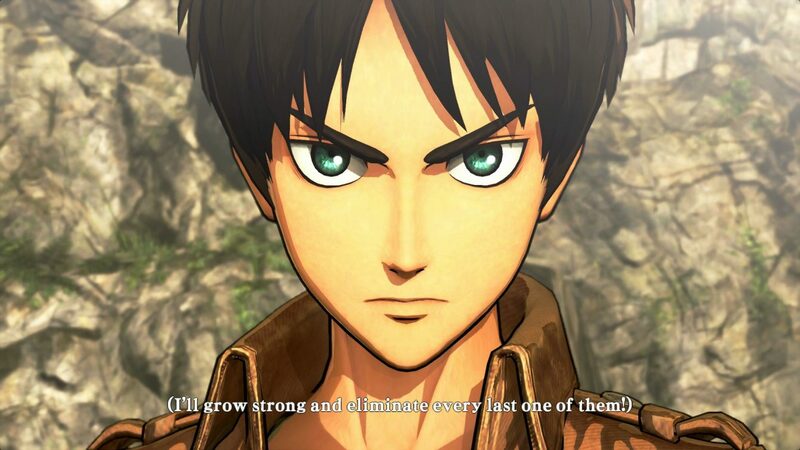 In the game the player takes control of Eren himself and of quite a few other characters, leading them in their struggle to slaughter the ravenous titans. 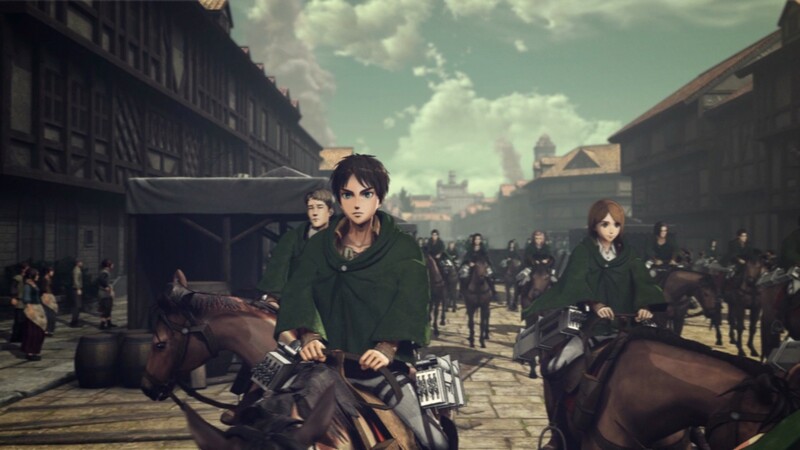 The graphics are quite advanced especially in the representation of characters and titans, with a cel-shaded effect that reproduces the visuals of the anime very nicely. Both in cutscenes and during gameplay, you’ll almost feel like you’re playing the anime itself, which in this case is very appropriate. Unfortunately environments aren’t on the same technical level, and often look rather drab and flat, definitely closer to a PS3 game even on PS4. That said, they’re enriched by quite extensive destruction physics. The massive titans can literally tear most buildings to pieces, and that’s quite satisfying to see. 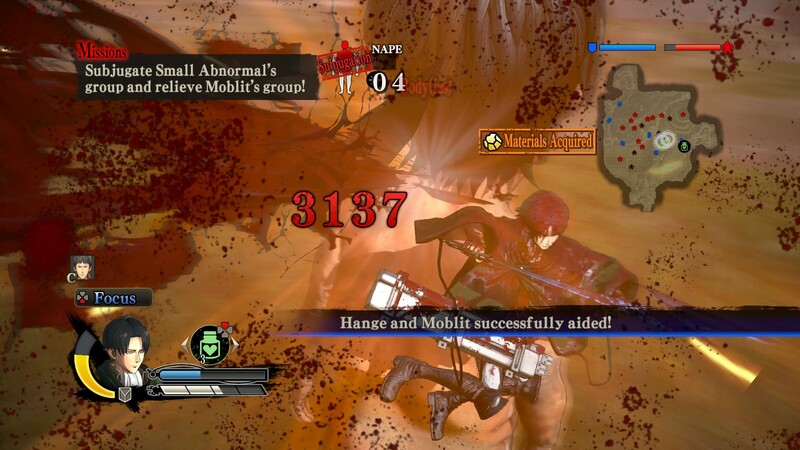 If we look at the overall picture, the game’s visuals are actually very fetching, especially when compared to most Musou games released by Omega Force. There is still room for improvement, but we’re getting there. The audio, on the other hand, is top-notch. 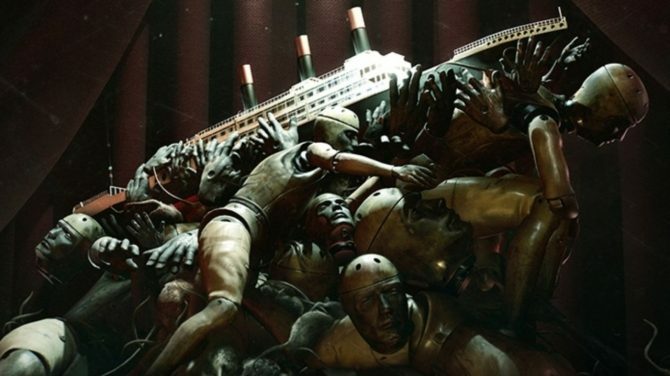 The soundtrack includes a variety of tunes that perfectly underline the story and the action. Inspired by the anime series, they’re great to get your blood pumping while tearing titans to pieces. Voice acting is even better. There is no English track, and if you’re familiar with the usual quality of western voice acting with this kind of productions, you probably know that it’s better this way. 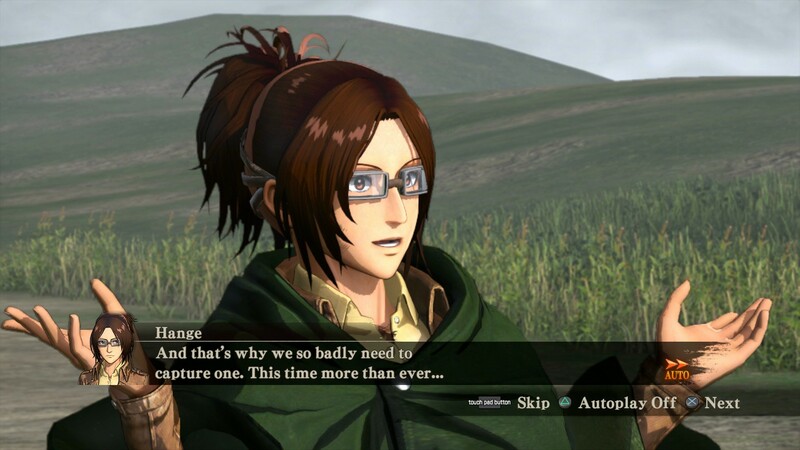 The cast includes several actors from the anime, and they do a masterful job in reprising their roles in the game, giving life to every character perfectly. Of course, adequate graphics and awesome sound don’t exactly set a game apart from the many inspired by various anime series and movies: what really hits the spot is the core gameplay. 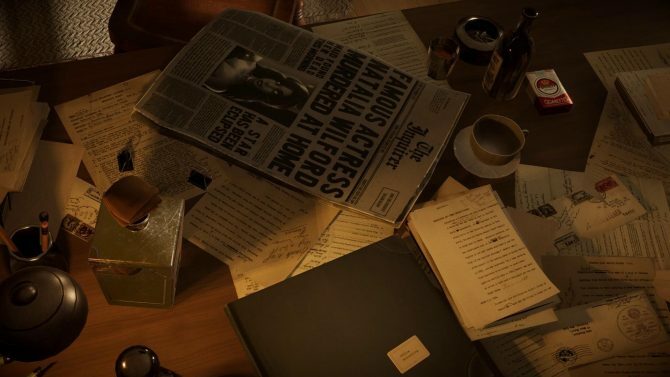 The structure of the game is pretty simple: you have a series of missions separated by cutscenes and small RPG-like moments in which you can explore your camp, talk with your companions and upgrade your equipment and weapons. 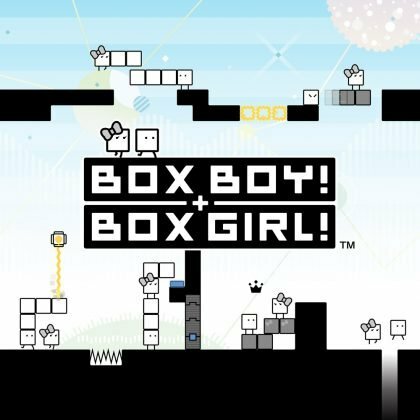 Further RPG elements exist in the game, with characters earning levels and automatically learning new skills that will increase their effectiveness in battle, but this certainly isn’t the core of the experience. 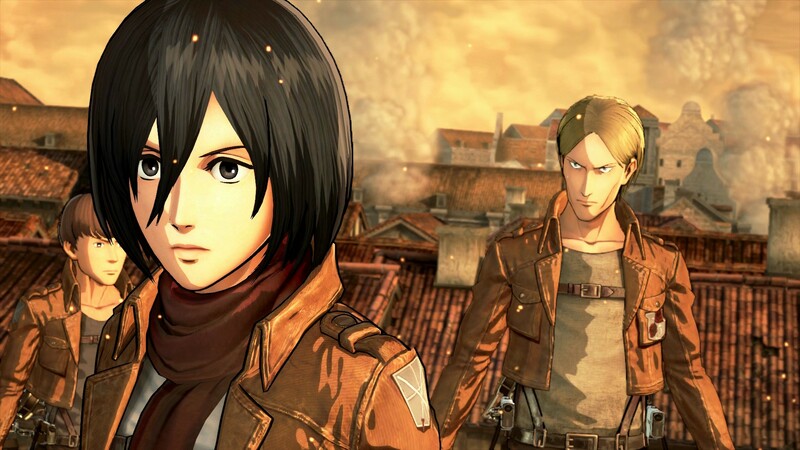 The Attack on Titan anime has been made famous by extremely fast action scenes in which the protagonists use the iconic Three Dimensional Maneuver Gear to basically become a dual-sword wielding version of Spider Man, exploiting steel cables and gas tanks to propel themselves across the sky and around titans, bridging the size gap that puts them at a disadvantage against their enemies. 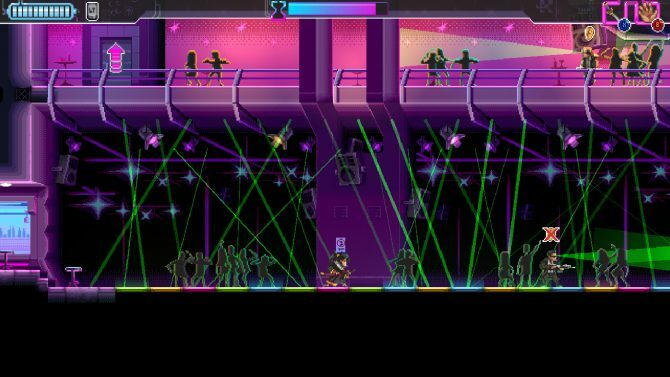 This is reproduced in a really natural way in this game, with intuitive controls and fluid animations, giving the game the twist it needs to really stand out. Traversing the relatively large environments is a delight, and executing daring maneuvers around the titans to land the perfect strike is extremely satisfying. In order to defeat a titan, players have to cut the nape of their necks, and doing so when they move around erratically (especially in a group) or try to grab you, requires a certain finesse, playing with the angle of attack and timing your moves by balancing momentum and precision in a nice risk versus reward mechanic. To actually deal sizable damage, you need distance from the titan, so that reeling in the cables will give you enough speed, this means that attacking as early as possible is normally advisable. That said, if the distance is too large, the titan will have time to move, possibly preventing your blade from connecting cleanly. Any correction to your course will reset your momentum, so you need to plan ahead, and know exactly when to strike. To make things easier, you can also sever a titan’s arms or legs, preventing him from grabbing you or severely hindering his movement. 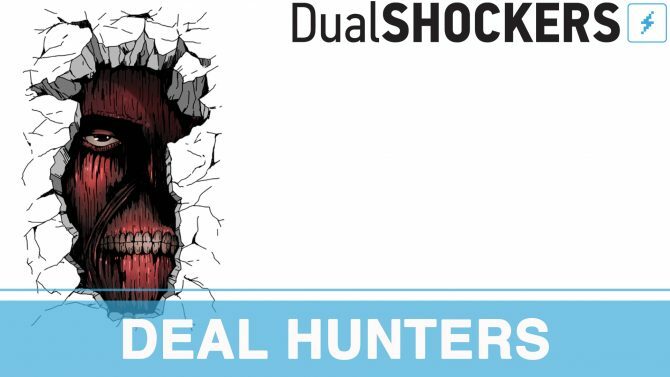 Risk and reward is the key here as well, as taking your time to meticulously mutilate every titan will lead to potentially cleaner kills (which are rewarded in your final score at the end of a mission), and also grants additional loot that can be used to upgrade your equipment. On the other hand, if you take too long, you risk getting swarmed, losing your companions and missing side-missions, which are normally timed. Further management is required by your equipment. Your blades will dull with use and eventually break, while your gas tank will run out. Both need to be replaced, and you can carry only a limited amount. You can pick more up from dead allies and from logistician soldiers, but this again requires time, so you’ll need to balance your “pit stops” with the sense of urgency provided by side-missions and allies in danger. A further twist comes with missions in the open field outside the walls, where there are very few structures that you can use as anchor points for your Three Dimensional Maneuver Gear. 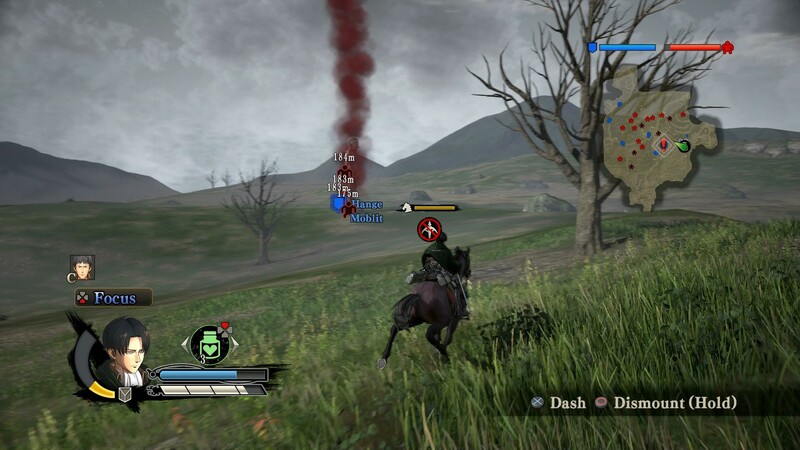 In those missions you’re given a horse, and you can seamlessly activate your Three Dimensional Maneuver Gear from the saddle, exactly like in the anime. While the combat system is absolutely awesome, things aren’t 100% perfect. 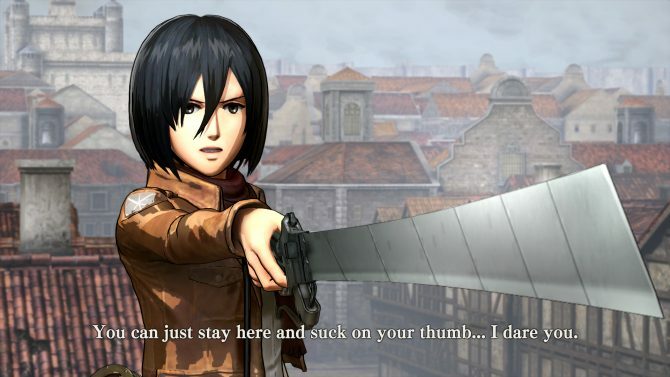 First of all, the camera can get really messy, especially when you’re close to a wall or there are several titans around you. The gameplay is so fast that the camera engine simply cannot keep up, and there will be times in which you’ll find yourself struggling to see where you’re going. Secondly, collision and ragdoll physics can be very spotty: often titans will clip into buildings or jiggle around like crazy eels when their falling bodies will fail to find purchase on a surface due to the irregular terrain. Horses also suffer from a few pathing problems. While the game offers quite a lot of content, the biggest problem it suffers from is that it’s very repetitive. A large number of missions have quite similar structures that will prompt you to slice a number of titans in a certain location or protect a certain objective, while secondary objectives will pop on the map to temporarily divert your attention. At the end a more powerful boss titan will spawn, and once you kill him, you’ll get your mission complete screen. There are a few elements of variation here and there, but not enough to avoid a sense of déjà vu. This is made worse by the fact that the game is really quite easy once you have master ed your Three Dimensional Maneuver Gear. On normal difficulty I haven’t died a single time, and the challenge of the game is more into getting a perfect score than in surviving. Considering the theme of the anime, this is certainly a missed opportunity. There is also a multiplayer mode that lets you team up with two friends to take down titans, but it doesn’t really feel particularly different from the single player. That said, it can offer a welcome distraction from the campaign. Ultimately, the battle system and the use of the Three Dimensional Maneuver Gear are what make this game worth your while. There are so many variables (velocity, angle of attack, distance and more) that influence the success of your attacks, that flying around titans and slicing them to pieces feels almost more analog than digital, and it’s something that video games rarely achieve. In most hack and slash games, killing enemies feels like a matter of mechanics (because it ultimately is), and of pressing a certain button at a certain time in a certain position. Attack on Titan is one of the few titles in which I really felt that achieving that perfect strike was more of a form of art. If the exhilarating battles and traversals are enough to keep you entertained, and to let you look past the repetitive mission flow and occasional glitches, you should really give this game a try. 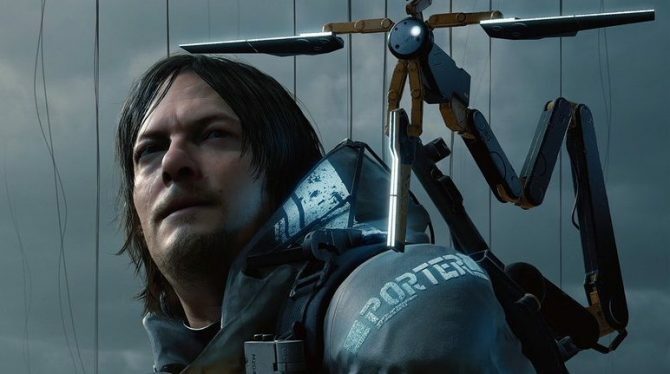 Of course fans of the series will appreciate the game even more, as it’s a quite faithful representation of what you have seen on TV. 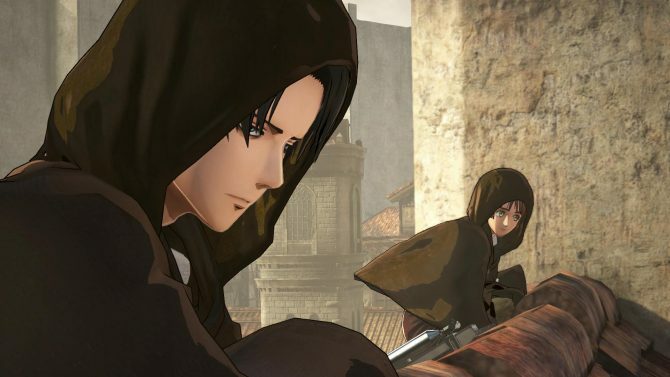 It’s rare, but anime-inspired games that do justice to their source material exist, and while Attack on Titan is far from perfect, it’s definitely one of those.